SBI PO Result 2019 - State Bank of India (SBI) declares the result of SBI PO 2019 separately for all the three stages - prelims, mains and interview in online mode. SBI PO result 2019 for prelims is expected to be released in the first week of July 2019. Last year, the result of SBI PO was declared in the form of pdf which had the roll numbers of all the qualified candidates. Along with the SBI PO result 2019, the authorities will also release the scorecard of the exam. After the declaration of the SBI PO result 2019, SBI will also release the state-wise and category-wise cut off. Candidates have to score more than or equal to the cutoff marks to be eligible for the post of Probationary Officer. 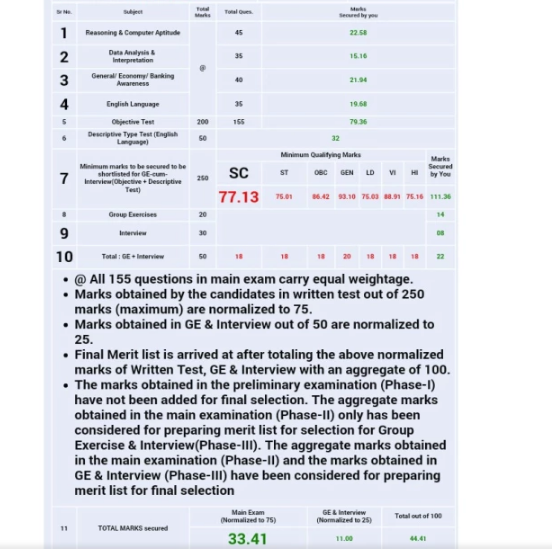 The SBI PO final result 2019 is prepared on the basis of marks obtained in the mains exam (objective+descriptive test) and GE & Interview. 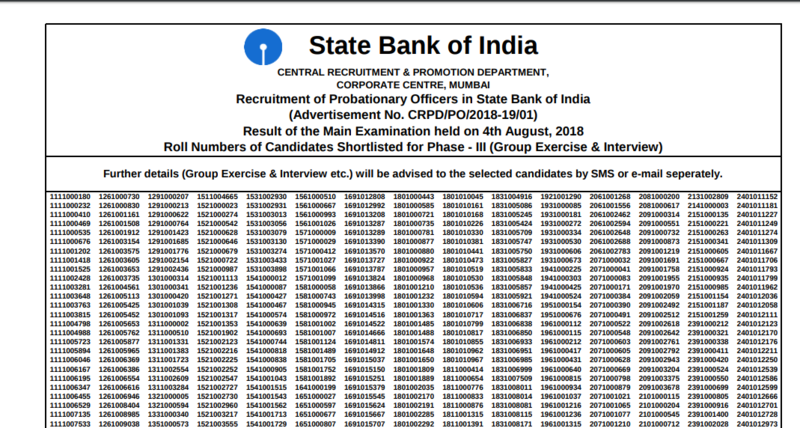 As per the final result of SBI PO 2018, as many as 2003 candidates have been shortlisted as Probationary Officers for 2000 vacancies. The important dates of SBI PO 2019 include dates related to different stages of the exam and results. Candidates can check below SBI PO exam and result dates 2019. State Bank of India will release the result of SBI PO 2019 preliminary exam in online mode. Candidates who will qualify the preliminary stage of the examination have to appear for mains examination. They also need to secure the overall and the sectional minimum qualifying marks of SBI PO preliminary examination in order to qualify the first phase. 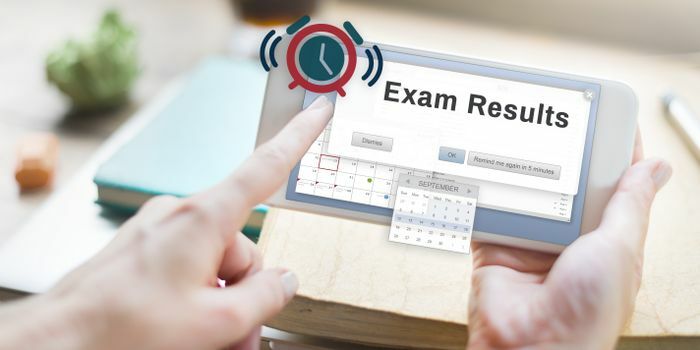 How to check SBI PO Result 2019 for prelims? The examination authority will also release the scorecard after the declaration of SBI PO result. Candidates will be able to download their scorecard by using their required login credentials - registration number/roll number and password/date of birth in the login window. SBI PO scorecard will contain the following details that are mentioned below. How to check SBI PO 2019 Scorecard for Prelims? How to calculate SBI PO result 2019 for preliminary exam? As per marking scheme of SBI PO, for each correct answer, one mark will be allotted. In case of wrong attempts, 0.25 marks have been deducted from total marks scored. The result of SBI PO mains exam will be declared in online mode. Candidates who will qualify in the mains exam will have to appear for the next phase that is GE and interview. As per last year notification, candidates, 3 times (approximately) the number of the category wise vacancies were shortlisted for the Group Exercise & Interview from the top of the merit list subject to a candidate scoring minimum qualifying score in aggregate. Candidates will have to secure the minimum qualifying marks in each section as well as overall SBI PO mains exam to qualify phase II. Last year, as many as 6009 candidates have qualified in the mains exam for appearing in the group exercise and interview. How to check SBI PO Result 2019 for mains exam? State Bank of India will also release the scorecard of SBI PO mains exam. Candidates can download their scorecard by using their required login credentials - registration number/roll number and password/date of birth in the login window. SBI PO scorecard will contain the following details that are mentioned below. How to check SBI PO 2019 Scorecard for Mains? How to calculate SBI PO result 2019 for mains exam? As per the marking scheme of the main exam, there will be negative marking of one-fourth marks out of allotted marks, in case of wrong attempts. Candidates qualifying in the mains exam will have to appear for Group Exercise and Interview conducted for 30 and 20 marks respectively. Those who will qualify in GE & Interview will be considered for SBI PO final result 2019. The officials will send all the details and further procedure of the group exercise and interview to candidate’s registered email IDs or SMS them on their registered mobile number. The final result of SBI PO 2019 will be declared on the basis of Mains and GE and interview marks. A category-wise merit list will be prepared for all the qualified candidates. The qualifying marks for SBI PO 2019 GE & Interview are decided by the bank only. To calculate marks for SBI PO final result, the examination authority has normalized the marks secured by the candidates. Selected candidates in SBI PO will be recruited on probation for a period of two years where they will have to undergo training. Candidates who will successfully complete the training period will be recruited as Probationary Officers in State Bank of India. State Bank of India determines cut off of SBI PO for all the candidates who will be appearing in the exam. The cutoff of SBI PO 2019 is the minimum qualifying marks that the candidates required to score in order to get shortlisted for the next process of selection - Mains and Group Exercise (GE) and Interview. Candidates need to qualify both category-wise cut off, as well as the section-wise cutoff in all the stages to get recruited for the post of Probationary Officer. Check previous years trends of SBI PO cutoff. Question: What details will be mentioned in SBI PO result? 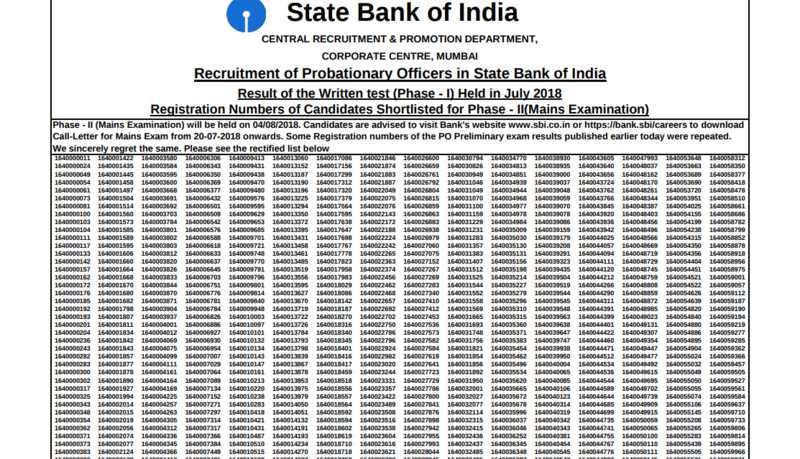 Answer: The result of SBI PO will contain the roll numbers of all the qualified candidates for the next stage of the selection procedure. Question: When will the SBI PO Prelims Result be declared and how to check it? Question: How can I check and download my SBI PO scorecard? Answer: To check and download your scorecard, you need to enter the required login credentials - registration number/roll number and date of birth/password in the login window. Question: From when can I fill the application form of SBI PO 2019? Answer: You can fill the SBI PO application form 2019 from April 2 to 22, 2019 in online mode. Question: How to calculate scores of SBI PO 2019 for prelims exam? Answer: As per marking scheme of SBI PO, for each incorrect answer, 0.25 marks will be deducted and every correct answer will be allotted one mark.